The holidays are my favorite time of year, they make me feel so warm and cozy and allows me to relish in my nerdiness by organizing my shopping list and budgeting spreadsheets! I’m excited to feature Kirsten and put some of her tips to calm the Christmas chaos into practice this year and enjoy a peaceful and stress-free holiday season! It was December 2010 and I was exhausted. I’d spent the past four months moving from California to Colorado, having a baby, and then traveling back and forth between those states with a newborn and a two-year-old–by myself– a couple of times a month. I realized I had presents to buy, cookies to make, Christmas lights to see, and about a hundred other things pulling for my attention because, well, it’s tradition! And, of course, I wanted my son to have a great Christmas. I knew my daughter wouldn’t remember, but it was her first, so it had to be special too! In typical Mom fashion, I overscheduled, procrastinated, and rushed around to make sure we saw All. The. Things. By the time Christmas came around my brain couldn’t actually remember what we’d done, but I knew it was a lot. Thank goodness we had the pictures to remind me. When the holidays were over I was even more exhausted than before. I couldn’t believe it had all gone so quickly! How was it even possible for it to be over already? It was a total let down. I was way busier than I would have liked and didn’t have that feeling I wanted to have. After that, I was determined to do things differently and it has made allll the difference. Our days still get hectic because it’s simply a busy season…but now, it’s a chaotic day rather than a week or month. I’ve become more intentional and focused and it’s allowed me to avoid the holiday stress that can plague your entire 4th quarter each year! I want to share three tips that will help you create more joy and avoid the Christmas chaos this season (and every holiday season) — so you can have the same feelings of connection and contentment that our hearts crave each holiday season! All of them. This means writing down everything. This is your “Master To-Do List”. This list should consist of two columns: every single thing you have to do and every single thing you want to do throughout the holiday season. This includes gifts to buy, activities to do, parties to attend, food to make, people to see, places to go, books to read, cards to write and everything else that make the holiday yours. If you’re not a natural list-keeper, you probably keep everything in your head, trying to remember it all. That leads to mental exhaustion and things slipping through the cracks. Either way, it’s frustrating because you never seem to get ahead and always feel like you’re behind or letting people down. This is why we need to write everything down in one place so you can see what you have. Once it’s all written down, it’s just a matter of organizing it and plugging it all into your calendar. People often overlook this because they either think they kind of “know” in their heart what it is, but never really stop to think about it. Or, they are so busy rushing around trying to keep everything together that they don’t think about it at all. Either way, actually sitting for 5 or 10 minutes and thinking about what you want and writing it down is critical. Talk to your spouse or partner and kids and get their input too. Then write it down on paper, (or electronic device) because it makes it more concrete…and when things are concrete, we’re able to make them happen. Plus, it will help you determine when to say no so you don’t get too busy or stressed out. How do I want to feel during the holidays? What are the emotions I want to have? When Christmas is over, it’ll be successful if…? When my kids are grown I want them to remember……? Also list any events, traditions or activities that are important to your family. After you know what things are most important to you, and you know what will make the holiday meaningful, you’re ready to make your plan! Without a plan and schedule in place, all of your wants will remain “wants” because you will get busy, you’ll forget, or it’ll be pushed off for later—then not happen this year. Which leads to the next step. 3 | Use your resources wisely. 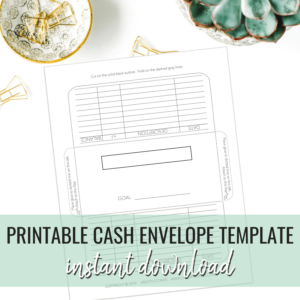 This helps you avoid the feelings of chaos because you’re deciding where to put your money, energy and time. This is where you create the plan that is going to carry you through the holidays without busyness and exhaustion. Resource levels are different for everyone depending on age, personality, and situation. You have to look at each of these areas and decide where to focus based on what’s most important to you. Let’s look at the resource of money. There are so many wonderful things to spend our money on during the holidays. From attending holiday performances to buying extra food for parties, to travel, to gifts and giving to charity. It can seem that there’s just not enough money to go around this time of year. By examining your budget, and following the guidelines of what’s most important to your family, you can choose the things that will make the biggest impact. The resource of energy is both physical and emotional. What can your body do? Are you a night owl who likes staying up late? Or are you an early riser? If you are a person that naturally has a lot of energy, you will be able to do more. If you’re a person that needs extra sleep or has lower energy, then realize that and don’t push yourself too hard. One of my clients has a sleep disorder that requires her to get a lot of sleep. When she doesn’t, it makes everything much harder. Know yourself and what you can handle before piling on more and more things. Our emotional energy is important too. For some people being around a lot of people and the hustle and bustle of the holidays is perfect! For other people, it’s a nightmare. A good friend of mine is an introvert that gets exhausted when she’s around a lot of other people. She has to be very careful about what events she commits to because doing even fun things is draining to her. Think about what you’re able to do while still getting enough sleep and having the emotional energy to do the things you want without being stressed. Lastly, the resource of time…Using it wisely is the key! This doesn’t mean always being busy and filling it up. This means being intentional with your time so the way you spend the few hours you do have is in line with the things that are the most important. Obviously, you can’t spend ALL of your time only doing things you want, but when you’re conscious of what you’re doing and realize that time is limited, you are able to make decisions that keep you from getting too busy, too chaotic and too stressed! When you combine all of these steps, you’ll be able to create the kind of chaos-free Christmas that you’ll remember with fondness because you weren’t too busy and stressed to actually enjoy it. When December 2011 came around it was just a few months after another move, and I had two little ones to share in the magic of Christmas with. I had my plan, and I did all the traditions I love, like making sugar cookies and chocolate-dipped pretzels, snuggling on the couch while reading my favorite Christmas books to my kids, attending parties and seeing all the best light displays within a 30-mile radius! But most of all, feeling happy that I was present—physically and mentally—to make the memories that will last long after the gifts are opened and the decorations put away. Put these steps in place, and you join me in having your best Christmas yet! Kirsten Reeder is the founder of Vibrant Mom Society, a company dedicated to helping moms find the joy in motherhood. Along the way she has made it her mission to help busy moms eliminate the day to day chaos so they can be the mom they want to be. She is the author of Joy in Motherhood, and works with moms in person and online to eliminate the chaos and make the time with their kids count! Wishing you a calm and peaceful holiday season! so many great tips!!! I feel like calm during Christmas is essential to maintain sanity! All so important to keep in mind over the holidays! This advice makes me think of creating a 4-blocker instead of a list to really categorize important and non-important tasks. Thanks for sharing! I find going outside is very calming. Taking a walk in nature is stress relieving and reminds me of my priorities. I agree that we have to communicate with our families to make sure that their needs are met as well. Thank you for sharing your tips. Great ideas Kristin. Thanks for sharing. 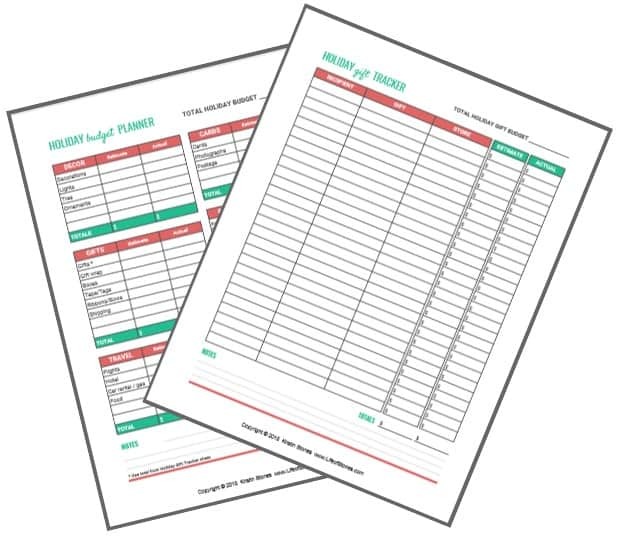 Get your FREE Holiday Budget Planner! 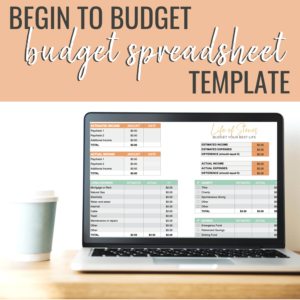 Download your free holiday budget planner to help you get organized during the holiday season and create a budget you can stick to!